Now, this is what I call breakfast!!! 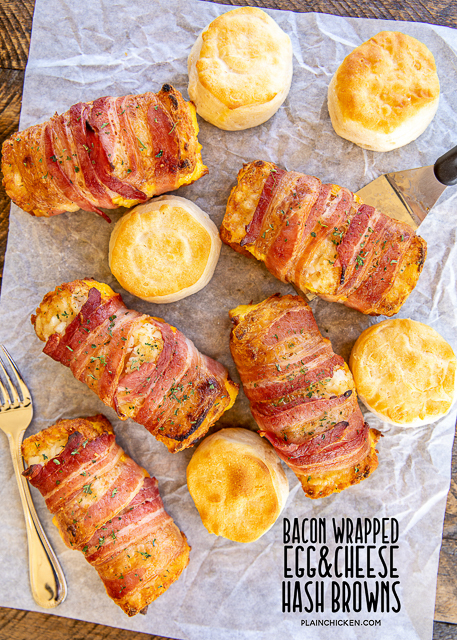 Hash brown patties stuffed with eggs and cheese and wrapped in bacon. These are AMAZING!!! 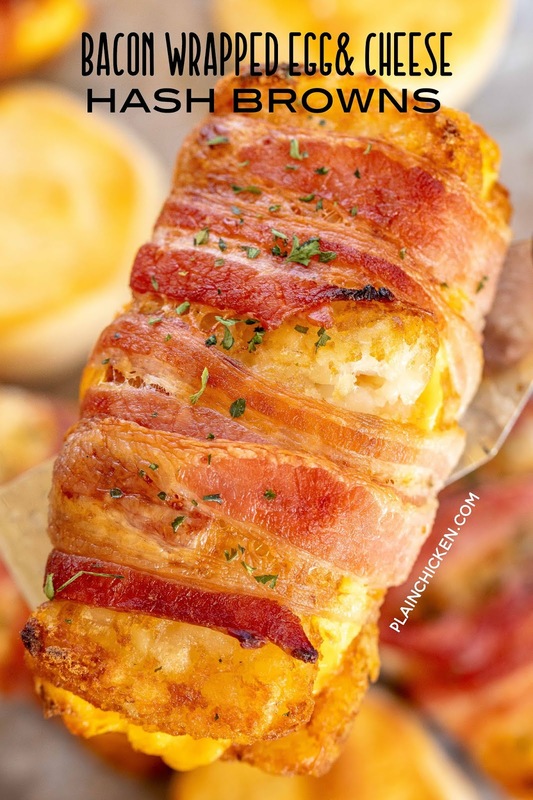 I mean, how could anything wrapped in bacon be bad?!?!? 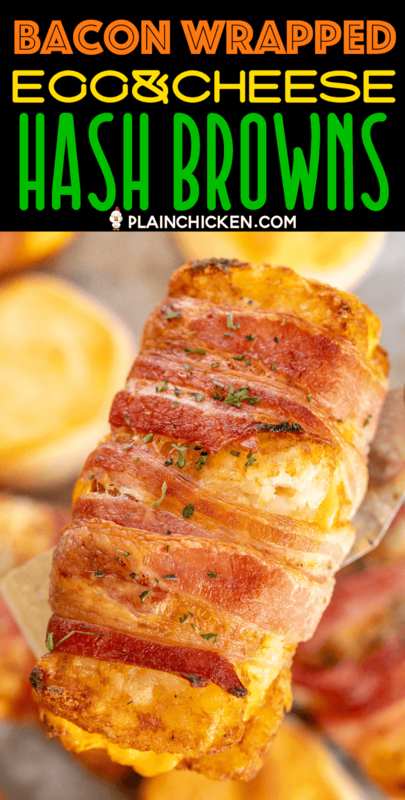 These Bacon Wrapped Egg & Cheese Hash Browns are kind of like a breakfast burrito without the tortilla. YUM! I actually prefer them over breakfast burritos or a traditional breakfast casserole. I used a package of Great Value Frozen Hash Brown Patties for this recipe. They were perfect. There are 10 patties in each package so you can get up to 5 Bacon Wrapped Egg & Cheese Hash Browns from each package. Since there are only two of us, I usually just use 4 hash brown patties at a time. I love that you can make 1 or 5 or 10 Bacon Wrapped Egg & Cheese Hash Browns at a time. I used cheddar cheese in this recipe, but feel free to use your favorite cheese or even a combination of two kinds of cheese. Whatever you like will work great in this yummy breakfast recipe! 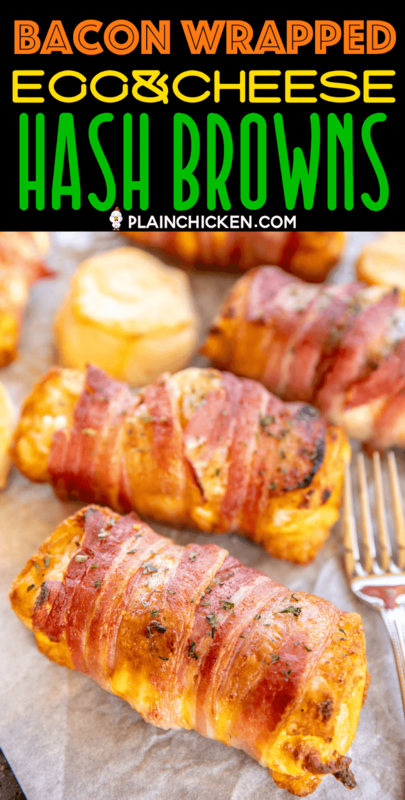 I baked these on a baking sheet in the oven, but you could easily bake them in the air fryer or toaster oven too!! 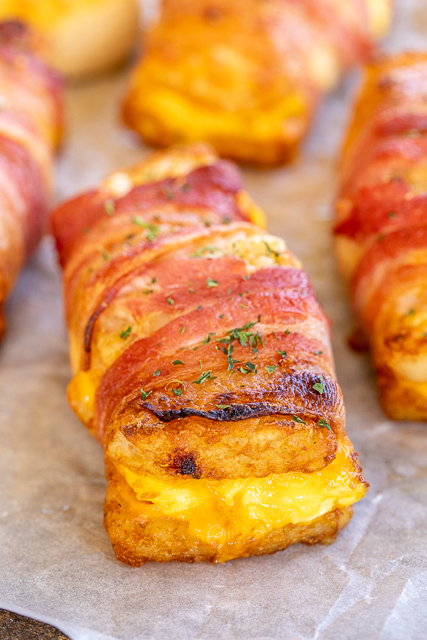 I like to make these Bacon Wrapped Egg & Cheese Hash Browns on the weekend. You can assemble them ahead of time and refrigerate overnight for a quick weekday breakfast. Great for overnight guests! You could also freeze them unbaked for a quick breakfast later. Just partially thaw them before baking as directed below. You may have to add a few minutes to the cooking time. 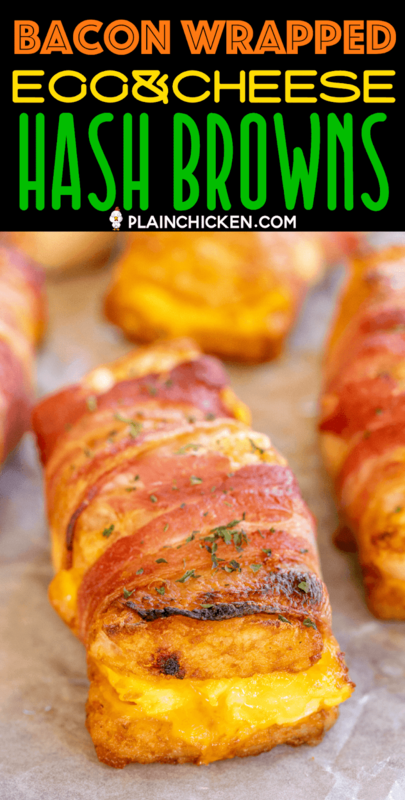 What to Serve with these Bacon Wrapped Egg & Cheese Hash Browns? 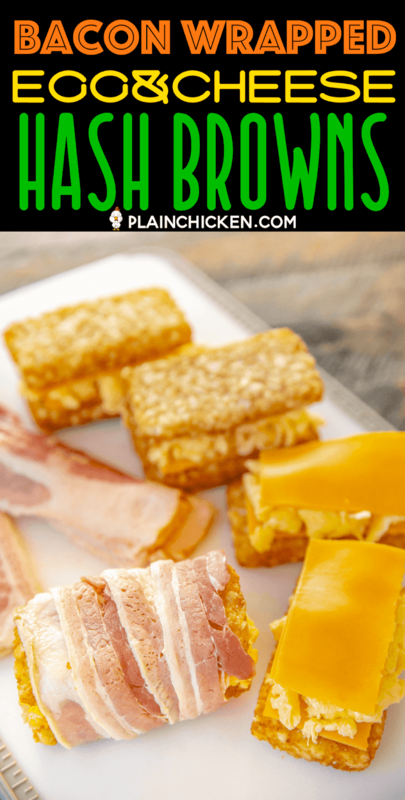 We are big fans of these yummy Bacon Wrapped Egg & Cheese Hash Browns. 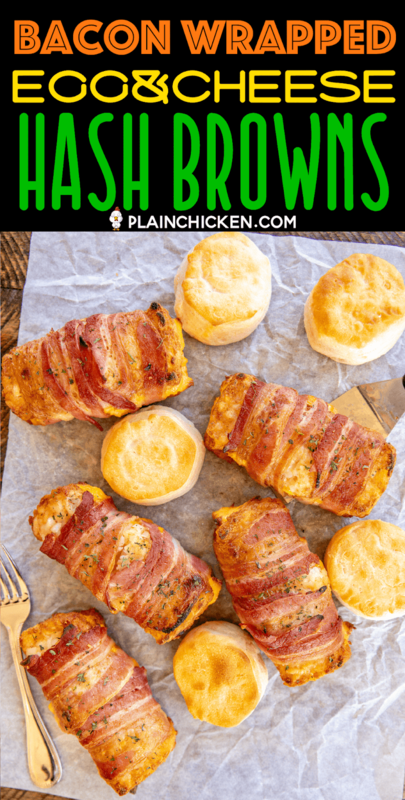 These are great on their own or with some biscuits and grits. YUM! Preheat oven to 425ºF. Line a rimmed baking pan with aluminum foil and top with a baking rack. Top one hash brown patty with half of a cheese slice. Top cheese with scrambled egg and top egg with remaining half of cheese slice. Top cheese with remaining hash brown patty. 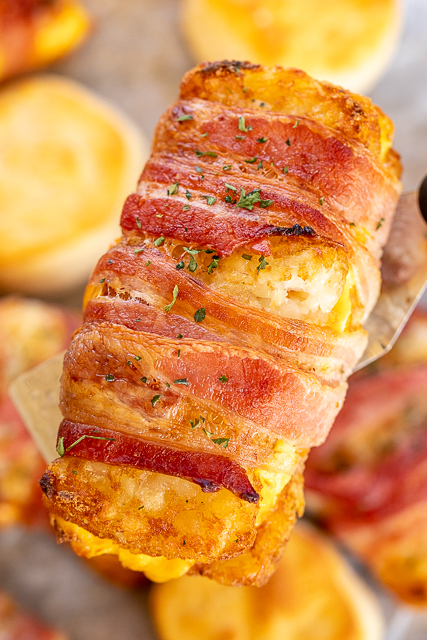 Tightly wrap uncooked bacon around stuffed hash brown patties. Place on prepared pan. 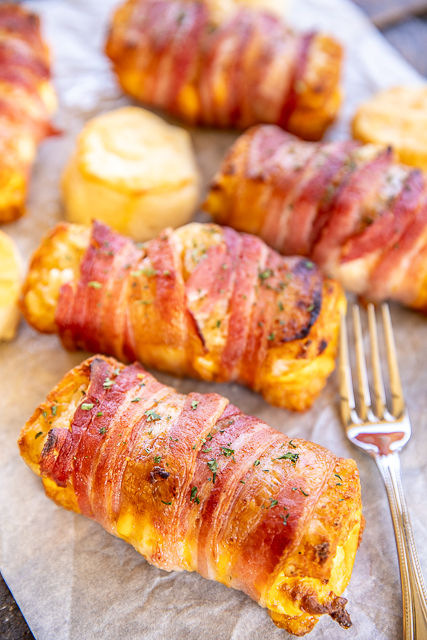 Bake for 20 to 25 minutes, until bacon is cooked. Place under broiler for a few minutes to crisp up bacon, if desired. oye yum and yum!!!! looks so good!!! Do you thaw the hash brown patty’s before you assemble or keep frozen? Hmm, I'm thinking this might be a good recipe for summer camping. Bake them all up before the trip then wrap each on in foil and throw in the cooler. Heat them up over the campfire the next day, the hasbrown and bacon might not be as cripsy, but the melty cheese will more than make up for it.